The many choices in golf balls include color variations. All regulation golf balls must fit specifications set by golf's governing bodies, the United States Golf Association and the R&A of St. Andrews, Scotland. Within those specifications, a variety of materials are deemed acceptable for golf-ball construction. Some balls claim to self-correct errant swings and stay on a true flight path. Others proclaim to go the farthest distance. Still others have unusual features such as being biodegradable or glowing in the dark. Balls are made from a number of different materials. A two-piece ball is made with a rubber, or synthetic rubber, core surrounded by a hard shell of plastic, usually surlyn. A three-piece ball has a second layer of rubber, rubber string or other softer material between the core and the shell. The four-piece ball has an additional layer between the shell and the third layer. Three- and four-piece balls are typically covered in urethane, which is softer than surlyn. Biodegradable balls are made from corn polymers. These balls dissolve in water and are often used for golf practice areas on cruise ships. Other factors being equal, golfers who have slower swings won't hit the ball as far as those with faster swing speeds. Distance balls have a hard feel and low compression. The energy from the club hitting the ball is absorbed and translated into speed and a farther distance. The USGA does have limits on how far a golf ball can go, including bounces and rolls and how fast a ball can accelerate when initially hit. Skilled golfers typically prefer golf balls with more control. These balls have a softer feel because of their multi-piece construction. The spin rate is higher than distance balls, allowing more control around and on the greens. Several golf-ball companies advertise that some models provide both control and distance. It's not unusual to have golf clubs that are fitted specifically to the individual golfer's body type, swing and skill level. Several manufacturers also custom-fit golf balls to the golfer through a series of questions. A ball is then recommended based on factors such as how far you hit the ball, whether you prefer distance or accuracy, the spin you generate, gender and age. 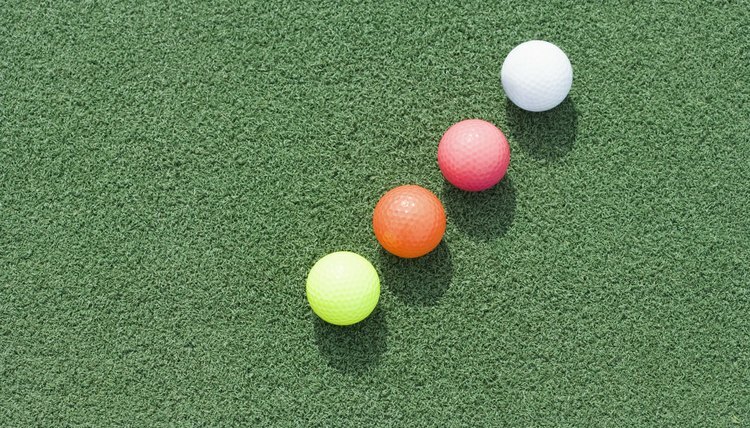 While golf balls historically have been white, several manufacturers offer balls in a variety of colors, including yellow, pink, green and orange. The USGA has no restrictions on the color of the ball. There are no restrictions on how the ball can be marked. It can have a logo, arrows or other marks, as long as the mark doesn't change the surface of the ball. Prices for new balls range from less than $12 per dozen to almost $50 per dozen. The price depends on the construction of the ball, the materials used and the manufacturer. Generally, two-piece balls are the least expensive, while control golf balls are more expensive.